Discussion in 'Standard E-Cigarette Reviews' started by Tim Wiseman, Dec 5, 2018. 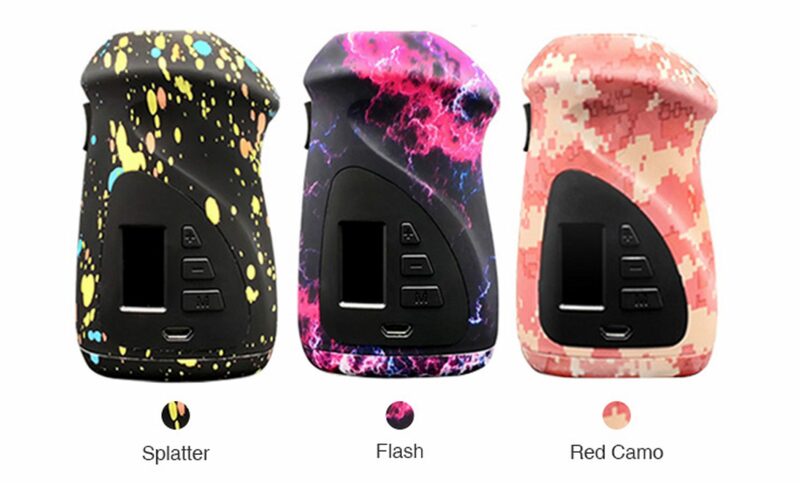 Hi ECF members, In this review i take a look at the Orbiter GT230 TC Box MOD from Hugo Vapor. 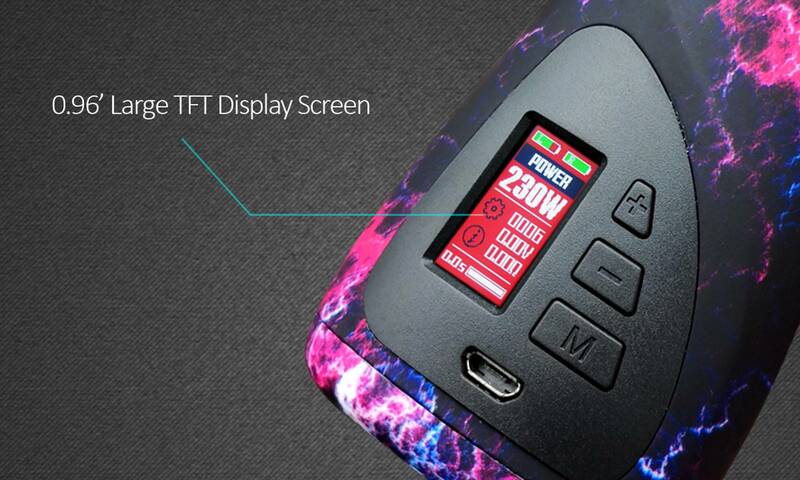 The Orbiter GT230 TC Box MOD was supplied for the purpose of this review by Alina from Everzon. Hugo Vapor are known for manufacturing devices that don't try to hide the fact they are design copies of previously released products but at more reasonable price's while (i can only talk about the couple of their devices i have used) still giving good performance. 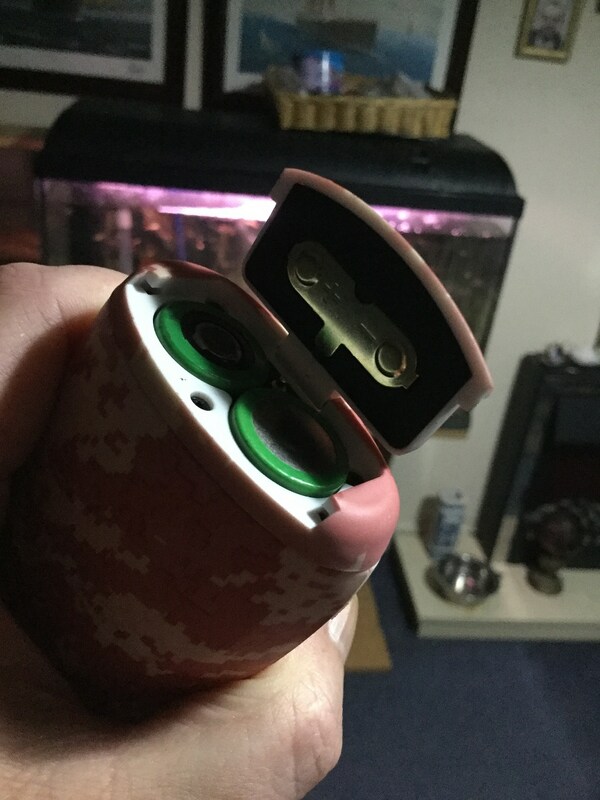 Of late they have released some products where they have used their talents to back their own designs most noticeably "The Ranger" which is a love it or hate it from an aesthetic point of view but whatever the opinion i found to be a damn good device. 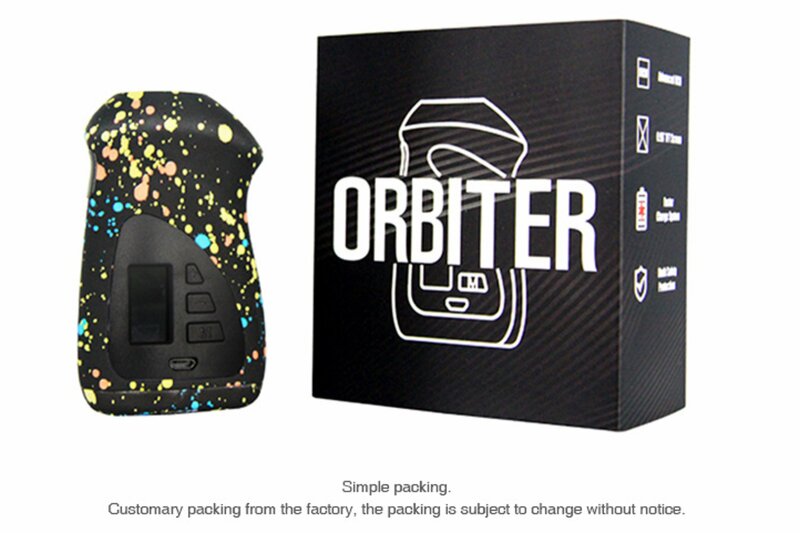 Here we have the Orbiter (to be honest not sure if this is 100% their design or a copy) a 230W ergonomic lightweight device that has all the features you would expect including full TC suite. 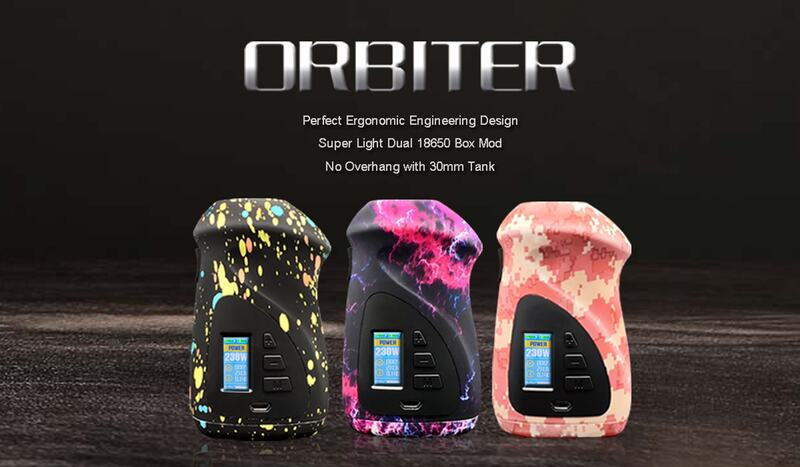 The Orbiter comes in three catchy designs is able to accommodate 30mm atty's without overhang and has a colour screen which allows customisation, so let's crack on and give it a look! 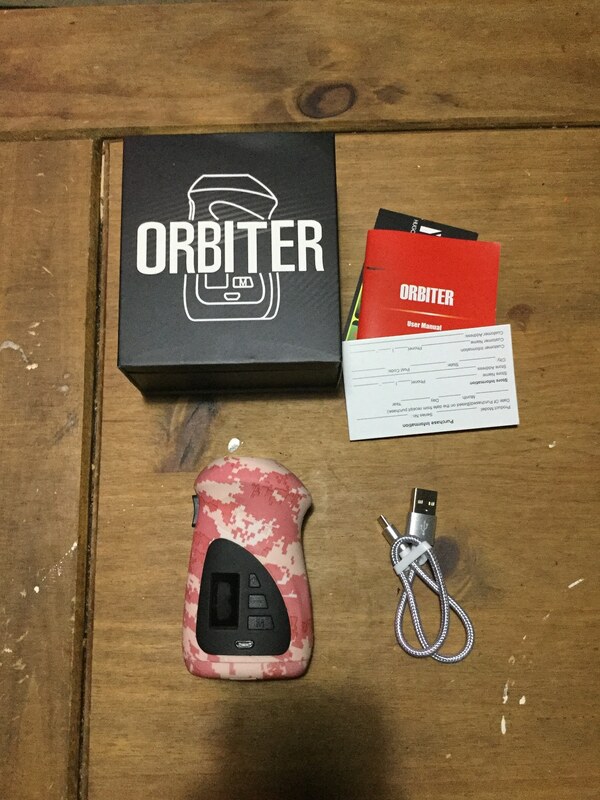 The Orbiter came in cardboard packaging and when opened i was disappointed to of received the Red Camo version which for the record is actually Pink and Salmon and looks terrible, after saying that it's just my misfortune and there is 2 other designs available which are Splatter which in my opinion looks ok and Flash which i think looks very nice. Probably the 2 most ergonomic forms are the curved to the contours of your hand type devices and the pistol grip style, the Orbiter combines the 2 and as a finger firer it doesn't get any more ergonomic than this. Picking the device up reveals it's very lightweight due to it's nylon construction and has a slight rubberised textured finish. 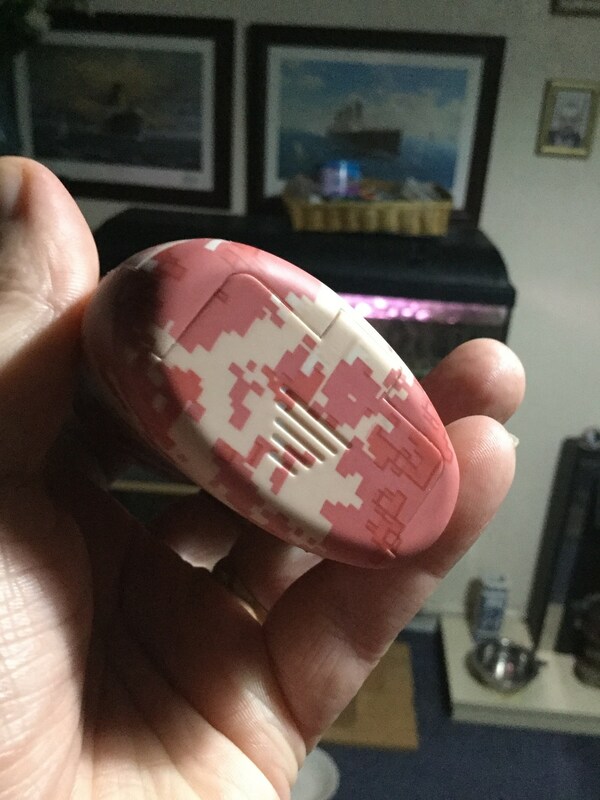 One side of the device has a Black plastic trigger style fire button which although made of plastic doesn't look bad, the front of the device has a Black plastic panel which unfortunately does have a cheap look to it but it is what it is. The panel houses the colour screen, navigational buttons, mode button and central bottom the micro USB port. The spine of the device has 2 small venting holes towards the top and moving to the base we have the battery hatch door which has some grooves to help with grip for opening. Up top we have a large 510 plate with Star of David engraving, the 510 is Gold plated and spring loaded. The Orbiter runs off dual 18650 batteries which are fitted via the bottom hatch door. Simply pull the door outwards slightly which releases it so it will open, no issues with the door it fastens securely and there is no movement or battery rattle. Marked battery orientation is very disappointing though with none inside the battery tubes and just press stamped onto the gold door contact so very hard to see. The display is quite sharp and bright plus the brightness can be adjusted, the background colour can also be customised which is a good job has mine came with a light Skyblue background as default and trying to read White information with such a light background was very difficult (what were they thinking? the light Skyblue shouldn't even be an option in my opinion because it just doesn't work). Anyway once altered to a more suitable background colour i like the display, we start at the top with your 2 battery bar status indicators, underneath this is the mode followed by your wattage (temperature when in temp control). Then on the left of the screen we have two icons, settings followed underneath by an info icon. To the right of the icons we have puffs, then volts (watts when in temp control) followed by the resistance of your coil. Finally at the very bottom of the display we have seconds vaped with a progress bar. The device is the usual 5 clicks to turn on and 5 clicks to turn off. The Orbiter is easy enough to use once you get to grips with how it works, to select the mode press the mode button 3 times which highlights the current mode on the screen then using the navigational buttons you can scroll through the options which are, Power, SS, TI, NI, Bypass, preheat and curve. When you pick preheat pressing the fire button 3 times allows you to set wattage and duration and when you choose curve again 3 presses of the fire button allows you to adjust your curve. When you are using temperature control again from the main screen press the fire button 3 times which now allows you to set TCR value, set wattage or set to default. To activate the icons on the left of the screen you need to hold down the mode button which causes the settings icon to blink you can now alternate between the settings and info icons using the navigational buttons. While the settings icon is blinking if you press mode again it brings up a screen of icons that you can scroll through and select which are clock (set time), puffs (reset puffs), brightness (adjust brightness), background Colour (choose between Light SkyBlue (not advisable), SkyBlue, Yellow, Red, Dark Purple or Green) and finally factory reset. If you press mode while the info icon is blinking it brings up information about the device and batteries. The only other feature is pressing both navigational buttons together locks and unlocks the navigational and mode buttons but the device will still fire. As mentioned the menu works easy enough but with there being an added mode button i would expect the menu to flow much more smoothly, it seems a little long winded. As usual i need to state i do not vape using temp control and do not have access to data so simply review devices as a personal vaping experience. I love the ergonomics and rubberised finish of the device, and the trigger fire button feels nice and gives a satisfying click. 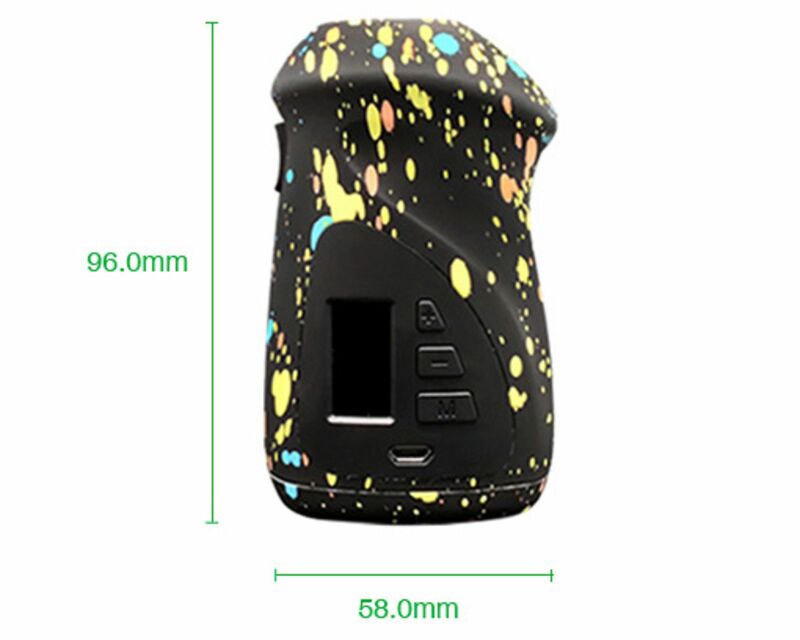 The device is incredibly lightweight making it very portable and the fact it can accommodate up to 30mm atty's without overhang will appeal to many. The menu system though could flow better with having a mode button and after about 70W it started to seem a bit underpowered so i would imagine it will be quite a bit short of the claimed 230W. After changing for a more suitable background colour i do like the main screen and must state my camera doesn't do it justice as it's sharper and a different background colour than what my pictures are showing (caused by bright glare of screen not agreeing with the camera on my ipod). If you use the clock on your device then i must point out that the time goes back to 00:00 whenever the batteries are removed. The Orbiter supports 2A charging and is fully firmware upgradeable. I would once again like to thank Alina from Everzon for supplying the Hugo Vapor Orbiter GT230 TC Box MOD for the purpose of this review.